INDIANAPOLIS (November 3, 2014) — Klipsch, a leading global speaker and headphone manufacturer, today announces the launch of its KG-300 wireless gaming headset. 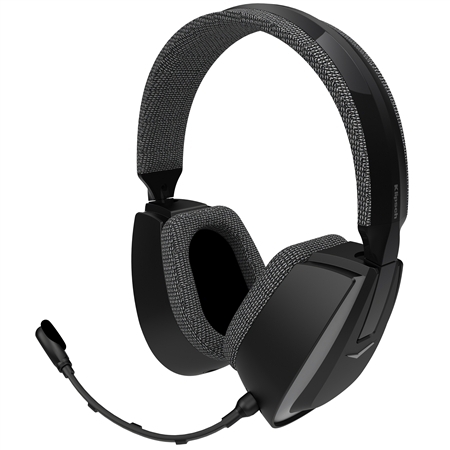 The new headset combines high-performance audio with the convenience of wireless freedom, and is designed for use with PlayStation 4, PlayStation 3, Xbox 360, Xbox One, PC and Mac. Klipsch’s KG-300 Wireless equips users with four EQ presets (Fidelity, Combat, Stealth and Sport) that are optimized for both stereo and surround sound. A detachable flex boom mic, Dolby® Digital Decoding and proprietary Klipsch SphereSpace Surround Technology create a life-like experience throughout play, while custom 40-milimeter precision tuned drivers enhance game surround effects for clear, 360-degree directionality of every detail. The headset features athletic mesh ear pads and headband for long-term wear, comfort and breathability, while still delivering superior levels of noise isolation. Large, easily accessible controls for EQ, chat volume, game volume and mic monitor are ergonomically placed on the headset’s right earcup. Its transmitter base includes digital optical, 3.55mm audio and USB inputs to deliver a high-fidelity experience. Three AAA batteries provide up to eight hours of wireless gaming freedom. The KG-300 Wireless joins the in-market KG-200 wired headset, which made its debut in January 2014 and retails for $129.99 (U.S. MSRP). The KG-300 retails for $229.99 (U.S. MSRP) and is now available for purchase at authorized retailers and Klipsch.com. Klipsch utilized its bold audio heritage to revolutionize the headphone industry after 60 years of making the world’s leading loudspeakers. Since 2007, the brand has engineered headphones that set the standard for comfort, performance, device compatibility and design. Klipsch has perfected the means for passionate listeners to experience the brand’s iconic sound signature on the go.Klipsch is also a wholly-owned subsidiary of VOXX International Corporation (NASDAQ: VOXX).